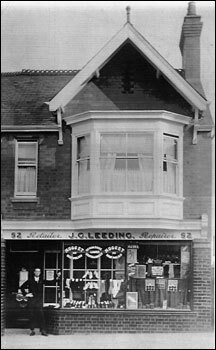 The shop was established by J G Leeding at 52 Station Road, where he sold boots and shoes and also offered a repairs service. 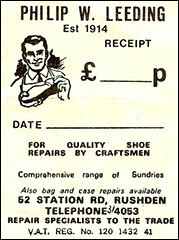 Not only did they repair footwear, but bags and suitcases too, and over the years have added other sundry goods to the list of goods. Bags, polishes, key rings, purses etc. 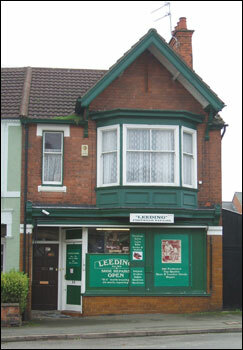 But their main trade has been repairs and they pride themselves on using the best materials and a good service. 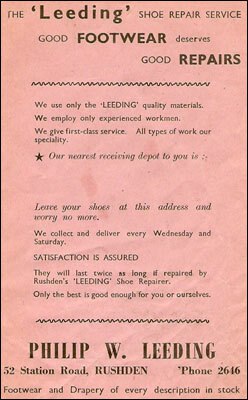 The advert (pink) below was displayed in participating stores, with a space for the name of the shop accepting repairs on Leeding's behalf, and they did the rounds to collect and deliver every Wednesday and Saturday. 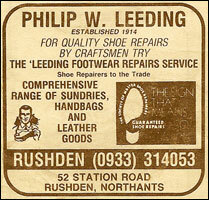 This was a particularly good service for the several villages around the north of Bedfordshire and also around Rushden. This receipt is from the 1970's; the telephone number is prefixed 31 - when the exchange changed from four figure to six figure numbers. An advert from the 1960's shows yet another change with the STD code added to telephone numbers. Since then another change in the 1990's when a number 1 was inserted between the zero and the 9. Only best quality shoes today are repairable!